Jessika Kenney is well known to Seattle audiences as a long-time member of Gamelan Pacifica and Seattle Harmonic Voices. For this concert she performs with violist Eyvind Kang, Iranian tar player and vocalist Parvaneh Daneshvar, and jazz pianist Dawn Clement to play original poly-modal compositions and improvisations with a spirituo-linguistic relationship to Classical Persian poetry. Jessika Kenney is a vocalist and composer based on Vashon Island. Her work demonstrates a deep appreciation and understanding of both traditional musics and experimental methods. 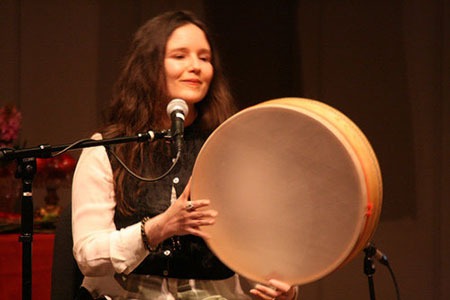 She has performed and recorded classical Persian vocal repertoire with ney master Ostad Hossein Omoumi, new and traditional Javanese music with Gamelan Pacifica and Gamelan Madu Sari, overtone singing with Seattle Harmonic Choir, and the music of contemporary composers such as John Cage, Hans Eisler, Lou Harrison, Eyvind Kang, and Tadao Sawai. Her teachers include the jazz vocalist Jay Clayton at Cornish College of the Arts in Seattle and Nyi Supadmi in Central Java, Indonesia, where she studied traditional Javanese vocal music and collaborated on music and theater in experimental settings. She currently teaches voice at Cornish College of the Arts, where she completed her music degree in 2007. Her recordings can be found on the Endless, Haft Dastgah, Ipecac, Koto World, Mimicry, Present Sounds, and Tzadik labels, and include The Stonehouse Songs with Jarrad Powell, the voice/viola duet Aestuarium with Eyvind Kang, and Voices of Spring with the Hossein Omoumi Ensemble. She has created numerous experimental wayang (shadow plays) including Maya in the Bardo (1996), and Atria (2006), as well as many other works for voice and mixed ensembles.